Since 14 February 2011, Bahrain has had extensive media coverage from international media and civil society organizations. European, American and Gulf political delegations visited Bahrain in order to get a firsthand account of the situation, provide advice for the various political parties and support the regime. The presence of international human rights organizations such as Amnesty International (AI), Human Rights Watch (HRW), and FIDH was noticeable. The delegations from these organizations came for fact-finding missions, and hence met officials, protesters, civil society organizations, NIHR, victim’s families and political societies. The delegations also visited hospitals, which received the dead and met with the injured, nurses and doctors. These organizations issued many statements condemning the use of violence and called for an investigation into the reasons behind the death of protesters, and the reasons behind the clashes between security forces and protesters. They demanded that those responsible for human rights violations be held to account and to compensate the injured. In addition, legal and administrative measures should be taken in order to prevent the recurrence of these incidents. International human rights organizations issued statements welcoming the release of detainees held on security and political grounds, and also welcomed the establishment of an investigation committee, which was ordered by the king. The noticeable presence of human rights organizations and their extensive communication with official bodies, civil society organizations and political societies helped all parties to control their action and reaction. Human rights organizations continue to monitor the events as they occur. Some of them are already preparing detailed and lengthy reports regarding the recent events. Usually these reports conclude with practical and legal recommendations, urging the Government to take specific steps to avoid more violations. During these events Bahrain also witnessed unprecedented media coverage from Reuters, AFP, DPA, AP, and many other Arab and foreign news agencies. Satellite channels were also present in high numbers and constantly provided live coverage, including: BBC, CNN, and to some extent Al Jazeera and Al Arabiya. Also, facebook and twitter provided live internet coverage of the unfolding events. Foreign media and human rights organizations were given the freedom to broadcast their reports without any pressure or harassment. On the other hand, Bahraini state media was forced to change its rhetoric, in order to conform to the new political reality. The State TV channel sent reporters to interview the protesters at the Loulou Roundabout and at Al Fatih Mosque. The protesters aired their demands, opinions, and even insults during these interviews. Generally, the State TV channel presented all the different points of view, unlike its counterparts in Egypt, Tunisia, Libya and Yemen. In general, the extensive presence of foreign media coverage on Bahrain provided an accurate account of the political developments in the country. It highlighted the fears and demands of the different political parties, and revealed the size of the political movements in the street. It also reflected the concerns and aspirations of the public, and revealed the weakness in the Government’s performance. Foreign media coverage also helped to expand the margin of freedom of expression, and helped develop the political discourse in the country. It is noteworthy that many rumours were spread during the first days of the clashes. This forced the political parties to speak directly to the public in order to clarify their position e.g. the Crown Prince, the Foreign Minister, and prominent opposition figures. All of whom, gave statements and conducted interviews regarding the events in the media. In summary, the local and international media coverage of Bahrain was useful, because the world was a witness to the events and was able to advise Bahrain. 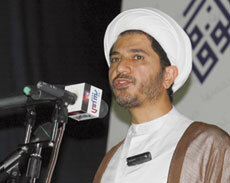 We hope that Bahrain remains open to all forms of media and human rights organizations.